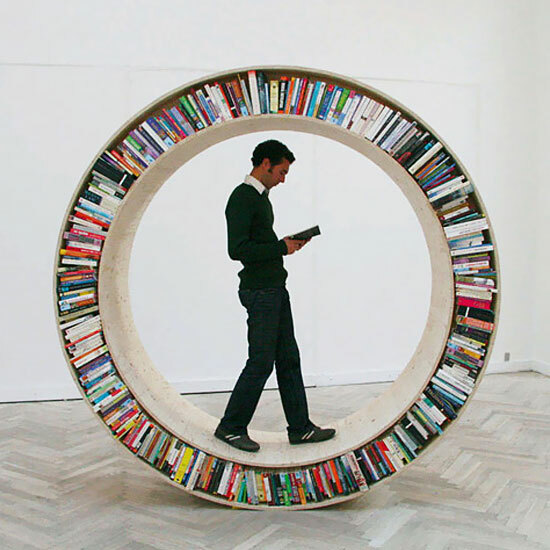 ARCHIVE II, a round wheel book archive, functions as a nomadic library, where the user can travel with his own books. Once still, it creates a room for meeting and inspiration, generating a special acoustic echo for the reader inside the wheel. Thank you all for the great comments. Unfortunately, this web sitehas not copied all the text. The project was a discourse on the absurd, and the contradiction of book collection and transport. The aim was to blur design and art. Archives series is only exhibited in galleries and museums, and not for sale as a functional object, the lack of functionality is obvious. i am so upset over the impracticality of this object! i must alert the creator to the obvious design flaws. when i am done i will go tell those fools who make the canned unicorn meat how ridiculous it is to market that when everyone knows unicorn is far better served as a carpaccio. How about making it a fixed DVD storage shelf, with a nice big flatscreen in the middle? Would take a buttload of DVDs to fill it, but geez, it'd look awesome. I for one think this is cool. True it's not practical, but I find it very artistic and kinda fun. Sure I might not walk around in it, but I think it's better than half the seemingly useless stuff I find in people's houses. Probably would make a hella good conversation piece. If not, set it on its side and you can have a little reading area in the middle. he just forgot to mention that you have to apply it to a treadmill, so you can read and work out at the same time.